Who You Callin A Soccer Mom? Before suburban moms fled to crossovers and SUVs, the minivan was the status symbol of the original MILFs. Though some may think of these vehicles as slow family haulers, we know better. 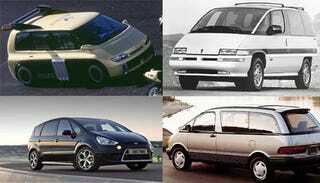 So, in honor of the 25th anniversary of the minivan, going back to the day the first Dodge Caravan landed in a family's garage, we, along with our commenters, have come up with this, the Jalopnik list of the ten best minivans of all time. Check out the best in sliding-door soccer shuttles below. Despite the epic name, the Honda Odyssey has never suffered from the sort of pretensions which led unlucky Greeks to fits of eye-gouging. The original model was heralded in the press and among consumers for its car-like handling, attributable to the Honda Accord platform which underpinned it. What it gained in nimbleness it gave up in space and sliding doors, limiting its appeal to a narrow segment of buyers. Successive generations of Odysseys have corrected these problems while still retaining much of the first generation's charm, though we agree with karan1003: the original is still the best. In 1991, the Toyota Previa looked like the future driving down the street on its way to soccer practice or a flute recital. Boys were quickly jealous of any flautist carted around in the unique minivan. The novel profile is a result of the Toyota's mid-engine design, which placed the four-cylinder engine practically underneath the driver's feat. While this provided an attractive shape, it limited engine size. The solution? Toyota applied a supercharger with an air-to-air intercooler, pumping power up to 160 horsepower. For wintry climates the All-Trac model was offered, meaning a few lucky souls had a supercharged and intercooled AWD minivan to taunt grzydj with. They're even driftable. We may have envisioned the original minivan, but our hats go off to the Europeans for adapting the model to create gorgeous MPVs like the Ford S-Max. Built on a platform shared with Volvo, the S-Max is one of the best examples of Ford's "kinetic" design language. The stylish MPV comfortably seats five adults and two children in a car with a footprint small enough to weave through narrow Belgian streets. Commenter layabout is happy they're available on his side of the pond and we're looking forward to the possibility of Ford selling them here. Dare to dream. GM was, typically, late to the minivan party. It took until 1989 for them to offer a full-fledged minivan in the form of the U-platform Pontiac Trans Sport/Chevy Lumina and Oldsmobile Silhouette. With its long sloping plastic-roofed greenhouse the Silhouette was always are favorite version. It was like a German expressionist nightmare of the future. The strange minivan offered numerous unique-for-the-time features including reconfigurable seats, air hose kit and the first remote-controlled power sliding door. Chrysler famously made fun of the minivan's appearance in an advertisement, which may have encouraged GM to design the next generation with the least amount of style as possible. Thanks to the plastic body panels and resilient 3800-series engine, there are still a few running versions out there haunting AndyMarkel. The Mazda5 is what you'd get if you tried to turn the Mazda3 into a minivan. Literally. Built on the same platform, Mazda3 + two sliding doors = Mazda5. It's a winning equation as the Mazda5 is one of the few minivans available with a manual transmission and the only modern minivan we'd be excited about driving. It not only outruns a Caravan at a stoplight, it bests it at the pump. As with PeterSternCan, our only complaint is we can't buy aMazdaspeed version. Hear that Mazda? Follow along with the rest of our Maximum Minivan Day coverage!